After Ritchie Blackmore surprised fans last year with a short series of shows under the name ‘Ritchie Blackmore’s Rainbow’ (featuring a new line-up, natch! ), rather less surprising is that he has decided to do some more, after initially insisting that he would only do this as a one-off. Another short run of dates is to take place next month (one of those is at Manchester Arena, which must be in doubt now since the venue is still out of bounds following the dreadful attack last week), and to coincide with these shows, he has issued the first official recordings under the Rainbow name since 1995’s ‘Stranger In Us All’ album. First up is a reworking of ‘I Surrender’, the band’s highest-charting UK hit which reached No. 3 in the charts way back in 1981. That track introduced singer Joe Lynn Turner to the group’s fans, he is not involved in this remake however; it is current vocalist Ronnie Romero who is heard on this version. Positives first: Blackmore still displays a deft touch on the guitar with some quite tasteful lead playing. Unfortunately, he does himself no favours with the backing – the drums sound flat, mechanical, as though it was a machine playing them. It turns out that it WAS – a comment on YouTube from a fan was met with a response from none other than Blackmore’s Night drummer David Keith, a.k.a. Troubadour of Aberdeen, who revealed that the recording only features Blackmore and Romero with everything else programmed. The result sounds lacklustre, the ‘drums’ could have come from a phone app. Romero impressed live, but this song is not suited to his voice. His harsher voice lacks the smoothness of Turner’s original delivery and all but destroys the radio-friendly sound of the original. The other track is an instrumental rendition of ‘Land Of Hope And Glory’; the piece has traditionally been used as a prelude to Rainbow shows, of course. It starts off with strings playing the melody before Blackmore comes in with his unmistakable guitar tone. This is also somewhat lacklustre, if only he’d actually brought his musicians into the studio with him it would have been so much better. Hearing one of the greatest guitar players of the rock era deliver what is frankly a half-arsed job over a drum beat that could have been purchased off the shelf is totally disappointing, especially after a two-decade wait for anything under this name. It actually sounds like a Blackmore’s Night demo, but you bet your boots had he done this under the BN name, he’d have put more effort into it. That’s what is so disappointing, he knows he has fans still who have waited a long time to hear him play rock once more, yet when he deigns to do so, he is so lackadaisical about it that you wish he had not bothered. As a Rainbow fan of many years’ standing, I am completely underwhelmed with this effort – listen to it on YouTube if you must, then dig out the old vinyl LPs to hear this man play with meaning, with menace – with passion. Not recommended. Bauer’s new monthly magazine, a companion to the DAB radio station of the same name, finally launched this month with a very nice cover, a reflective silver effect front and back featuring the Motörhead ‘Snaggletooth’ logo. With former Kerrang! editor Phil Alexander in charge, and with several writers known to music mag readers contributing, this is a top quality publication as expected. It is clear Bauer have indeed sunk a lot of time, effort (and money) into its launch. So what do you get for your fiver (cover price)? No covermount CD (though they may issue one occasionally in future issues), but the expected mix of in-depth features on classic rock bands (Aerosmith and indeed, Motörhead feature in the launch issue, with an extensive interview with sole surviving member of the ‘classic’ ‘Head line-up ‘Fast’ Eddie Clarke taking several pages); a staggering TEN pages devoted to Def Leppard and the convoluted process behind the making of their seminal ‘Hysteria’ album, excellent pictorial content, reviews of the latest albums and live shows, and a few more offbeat features – for example The Hairy Bikers quiz Blackberry Smoke’s Charlie Starr about his favourite foods. Another Planet Rock presenter (Alice Cooper) is also featured, with an anecdote about how he, John Lennon, Harry Nilsson and Micky Dolenz of the Monkees were persuaded to pose for a photo with Canadian singer Anne Murray, who was known more for middle-of-the-road pop than hard livin’ rock ‘n’ roll! In addition, the magazine provides a run-down of gigs in the upcoming month that Planet Rock readers/listeners should be interested in attending. The magazine is a very good read, but you will forget it is a new publication because the style, the layout and overall ‘feel’ of this magazine apes the long-standing Classic Rock magazine almost exactly. The impression is that of Bauer (a large multimedia concern) parking their tanks on the lawn occupied exclusively by Classic Rock until now. There has been a lot of effort put into this publication – it hasn’t just been thrown together – and that suggests they’ve been planning this for a long time, even before CR’s publishers Team Rock went under at the end of 2016, with the magazine only rescued from closure by previous owners Future Publishing. Bauer are a much bigger operation than Future or Team Rock, and they must have eyed the healthy circulation of Classic Rock with some envy. Bauer have also recently disposed of weekly mag Kerrang! after having published it for around two decades; I’m no media analyst but the demographic of older rock music fans who still spend money on gigs and albums, is one that must have been more appealing to Bauer than the transient readership of Kerrang! I can only conclude that Bauer are aiming to ’embrace, extend, extinguish’ the existing publication then; they are putting a great deal of resource into this magazine and if it does steal readers from Classic Rock, it is inevitable that Classic Rock magazine will either fold or be swallowed up by Bauer, ultimately being ‘merged’ into the Planet Rock brand. All that said – is the Planet Rock magazine worth checking out? Absolutely, if you like this kind of music and are a listener to the station, you will find much to enjoy in the accompanying magazine. I do predict that within a year, this magazine will be the only one available on the newsstand for fans of classic rock music, though. OK, this one really hit home. The majority of my ‘out’ time is taken up with concerts – I’m not one for nights on the town, generally and parties tend to bore me. But I do enjoy a good live gig, whether it be watching a band play a small gig in a local pub, or watching a major band in a huge arena production along with tens of thousands of other fans, as was the case last Saturday when Iron Maiden came to my city. They also played in Manchester a fortnight before then, and under different circumstances I might well have been at that show rather than Liverpool. It is a venue I have visited many times over the last two decades, I know it extremely well and that’s why I was watching BBC news in the early hours of Tuesday morning with an increasing feeling of dread and horror, as pictures flashed up on screen of terrified concert-goers fleeing the venue into the adjoining Victoria railway station. It was clear from the early pictures that initial reports of a speaker blowing up were just not true, as people on screen were shown being helped from the arena in tattered clothes. That night’s show at Manchester Arena by US singer Ariana Grande, had just ended when a blast was heard. Within minutes, as television showed a convoy of emergency vehicles heading for the arena, it was obvious that this was a horrific act. As details began to emerge it was clear that there would be casualties, as police soon confirmed what we had feared – a terrorist attack had killed and injured many as they left the venue. Soon television networks across the world were carrying the pictures, as it became clear Manchester had been hit once again by a terror attack. The fact that a concert was chosen as a target was terrifying enough – having been to that arena so many times myself I counted myself fortunate not to have been there that night, but the fact that it was a show from a performer popular with teenage (and younger) girls which was targeted, really chilled the blood. It was devastating to see the faces and names of those caught up in the blast, ranging from an 8-year old child to parents who were just waiting on the concourse to collect their children. A lot has already been said regarding this atrocity, which I shan’t reiterate here, but the fact that the attacker didn’t even need to enter the venue itself to cause this much death and destruction was what really chilled me to the bone. Much has been made about the security arrangements going into the arena; the tightest security on the door would not have stopped this attack because he did not actually reach that door entering the hall. The attack is bound to have huge implications for concerts across the country; venues nationwide are already stepping up and/or reviewing their own security procedures. Manchester’s arena is the largest indoor arena in the UK, with a maximum capacity of 21000. It draws people from not just the Greater Manchester region, but from across the country and all over the world, with its wider catchment area taking in Merseyside/Lancashire/Cheshire, North Wales, West Yorkshire and the Midlands. It is almost always visited by major international stars when they come to the UK, often to play only a handful of shows. In addition, it has staged major boxing events, has hosted ice-hockey and basketball, and was used during the 2002 Commonwealth Games held in Manchester. On the night of the Ariana Grande show, it would have held around 15000 people with the floor seated and the stage at one end of the arena. The operators SMG are responsible only for the area after that foyer; not the steps leading to the car park, not the walkway to the station and not the station itself. Other large-scale arenas in the UK will now have to review their own security – Liverpool’s Echo Arena is a bit different, sited close to the River Mersey and not near a main line railway station (the main bus station is across the road and a few minutes’ walk away), it also has a more open concourse but how is it possible to legislate for one man so determined to cause mass destruction that he would be prepared to blow himself up in the process? Certainly the Manchester Arena will be out of action for some time; at the time of writing it remains a crime scene and is cordoned off still, as is Victoria Station. Police forensic examinations are ongoing, and with such a huge site to cover it must surely be several days before they can even think about reopening. The scale of the damage is not yet clear, despite some leaked images from the site which were published by a US newspaper (causing a row between UK police and US intelligence) but, given what we already know there must be considerable damage to the foyer area, the walkway to the station and probably the roof of that area. Whether there is damage to the actual arena concourse is not yet known. All of that will have to be repaired and made safe; this can only take place once forensics are satisfied and the area cleared. Even when that work is completed, there will have to be a total review of the security in and around the arena and the station. The arena is accessible through a car park, via entrances on Hunts Bank and also Trinity Way, as well as the entrance through Victoria Station. Consequently, that means upcoming shows will need to be postponed. Take That’s scheduled concerts for this weekend have obviously been called off (they performed at Liverpool on the night of the attack in Manchester, and postponed a second date upon hearing of the tragedy. They will perform in Liverpool on Friday 26th May on a date originally intended for the Manchester Arena.) This almost certainly means that the upcoming concert by US rock band KISS is off too; it was due to be played on 30th May and although no official word has yet been confirmed, it is extremely unlikely that the venue will be back open again in time for that show to take place. Even if it were, how would fans feel about heading to that same venue so soon after such a horrific attack? UPDATE: The KISS show at Manchester Arena is now confirmed to be off; the other UK dates will go ahead as scheduled. There are many events scheduled for the arena in the coming weeks, one I am booked for is the performance of Ritchie Blackmore’s Rainbow on 22nd June. Whether that (or indeed the other forthcoming events) goes ahead is at this stage questionable. As for Ms Grande, a singer about whom I confess I knew little about until this dreadful night, she has understandably cancelled her remaining European dates and returned to the US. She went to ground shortly after posting a tweet stating that she was ‘broken’. How that will affect her in years to come remains to be seen, whether she can – or even wishes to – set foot on a stage again is something only she can decide. I for one am still trying to process this even several days on; as a dedicated concert-goer who has spent many evenings in that building I confess I would feel apprehensive about ever setting foot in there again. However, the other side to that is I do not want to let these people succeed in their aims, therefore I shall still be going to concerts both there and elsewhere. Nevertheless, I do feel that it should be some time before that venue opens its doors to the public once again, as a minimum I would say keep the place closed for a month. The music scene in Manchester is famous the world over, the city’s many venues host live bands on a nightly basis. The arena is the flagship, and after a suitable period it will doubtless play host once again to the biggest names in music. A lot’s happened since the last time we heard vocalist Bruce Dickinson utter that at an Iron Maiden gig in this city: your humble correspondent was still a young man in his twenties at the time for one thing, Liverpool FC were league champions, few had heard of Nirvana and the site where the Echo Arena now sits was a large overspill car park for the Albert Dock. That gig, a staggering 27 years ago this year, also came before Dickinson exited the band to be replaced by Blaze Bayley (guitarist Adrian Smith had already packed his bags, being replaced by one-time Gillan guitarist Janick Gers), before he and Smith returned to the fold in 2000. So the anticipation of this gig was palpable, even though when the tour dates were announced last autumn, I for one didn’t want to believe it until I saw Bruce, Steve, Nicko, Dave, Adrian and Janick on that Echo Arena stage! The band members are now either approaching 60 or have already passed it; consequently in recent years they’ve eased back on the relentless, extensive tour schedules they are known for in favour of large outdoor festival dates. Their last arena tour was in 2011 and for this run, they made a point of including cities they had either not been to before or hadn’t played in a long time. The fact that many more cities have a large-scale venue suitable for their stage show now made that possible, and the fact that this date fell on a Saturday made this show attractive to travelling fans. On the day of the show, you could not move for Iron Maiden T-shirt clad people, with the focal point being the Baltic Fleet pub, normally a quiet dock road pub which brews its own beer on the premises but on this occasion, the setting for the ‘Trooper’ gathering. The band had chosen the pub as host for its pre (and post show) gathering, with ‘Trooper’ beer on sale and band mascot Eddie stationed outside to greet fans. When the dates went on sale much was made of the band’s efforts to thwart what is euphemistically described as ‘secondary ticketing’. The system put in place was not to print out tickets, rather you needed to produce photo identification plus the card used to purchase the tickets with. That meant if there was a group of say, four going, all had to be together at the venue entrance. The band and manager Rod Smallwood also put in place a system for fans who genuinely could not make the date that they’d booked and who wanted to pass on their ticket, although as the date drew closer, actual tickets were issued to fans who had booked for the seated areas. For those who had plumped for the standing floor, the original arrangement of turning up at the venue with ID and payment card stood. On the night, there were massive queues at the Cityside and Riverside entrances, while those of us booked for standing were directed to a low-level entrance away from the main doors. Expecting a massive queue, I arrived shortly before doors to find only a small line in place. At this point, venue staff asked us to have our cards ready with ID, as a team of staff worked their way down the line. They were armed with what looked like bus ticket machines (!) and upon verifying the card and ID, their machines printed a small ticket out there and then for entrance. The doors soon opened and I’d noticed the queue I joined ten minutes earlier had quadrupled in size, so my timing for once was excellent! The system worked better than I’d anticipated and I soon found myself in the empty arena, where a crowd was already gathering at the barrier. I’d expected to be at least halfway back, as it turned out I was about five off the front, right of centre. As the crowd began to filter in, I noticed several different languages being spoken in the crowd around me. It turned out there were fans over from Italy, Poland, Argentina, Brazil and several other countries. As someone who has had to do a fair amount of travelling myself to see bands, this was a big deal that this show had brought so many foreign visitors to Liverpool. It also brought it home to me how important it is to have such a venue in your city, from a tourist standpoint – these people could have gone to say, Manchester instead (and probably did fly into the country via Manchester Airport before heading to Liverpool). With the doors opening just after 6pm, it was quite a wait before openers Shinedown arrived on the stage, the place had filled up a lot by then. Having seen these guys twice before in similar settings (last year in this same hall) I had few expectations. I like their music – at least, the material they focus on (they generally overlook their first two albums of the five they have done) but, I’ve never really taken to frontman Brent Smith. When I first saw this band in 2013, as special guests to Alter Bridge, I was unimpressed with his tendency to make long, rambling speeches (while standing on a box) between songs. Last year’s set was an improvement however, his between-song chats were shorter and this time out, he and they were more focused on the songs, not the speeches. Opening with ‘Devour’ from their breakthrough album ‘The Sound of Madness’ they gave a hard-hitting but enjoyable set taking in material from that record, plus follow-up ‘Amaryllis’ and most recent offering ‘Threat To Survival’. Smith’s vocal sounded stronger this time too, and he was well backed vocally by guitarist Zach Myers. He did try his usual trick of encouraging the audience to turn to each other and shake hands, to usual British resistance (!) and his main speech part came when introducing ‘Enemies’ – he came out into the crowd and urged the crowd (‘the legendary Liverpool’ as he called us!) to start jumping when he brought the band in. By and large however, it was more rock killer than filler, though he (like many of us) was shaken by the shock death of Chris Cornell just days before this show. He asked for – and got- a brief moment of silence from the crowd in memory of the Soundgarden frontman before resuming proceedings with ‘Cut The Cord’ from the last album. They ended with ‘The Sound Of Madness’ before making way. This was another improvement on the last time I saw them, as stated earlier I do like their music but had this been the performance I’d first seen from them, I’d probably be more of a fan than I actually am now. Some things never change, and after some feverish work from the crew in decking out the stage in preparation for the headliners, a huge cheer went up when UFO’s ‘Doctor Doctor’ came through the PA. The traditional prelude to a Maiden show, as soon as it was over the lights went down, as Bruce Dickinson appeared at the back of the stage atop a massive platform, behind what appeared to be a witches’ cauldron. He sang the intro from the back before the rest of the guys burst onto the stage, kicking their way into opener ‘If Eternity Should Fail’ from the current album. From that point it was traditional Maiden; Dickinson running all over the stage ramps while guitarist Janick Gers ran straight to the front, throwing his shapes, and balancing his left leg on the ‘speaker cabinet’ prop placed there specifically for his use! Gers comes across as the fan in the band; he remained with them even after Adrian Smith returned and it is he who has the most ‘face time’ as it were, always grabbing the attention alongside bassist Steve Harris while Smith and fellow axeman Dave Murray handle the majority of the lead guitar work. Janick’s role is more cheerleader, his guitar parts live tend to duplicate Adrian Smith’s (he replicates the solo in ‘The Trooper’ note for note for instance) but acts as the foil for Dickinson’s stage antics. It’s Gers who gets grabbed by the head, or has a flag dangled in front of him by the singer for instance, but amazingly, never misses a note while all that’s going on! The current album has its fair share of epics including ‘The Red And The Black’ and the title track itself, which saw a ten-feet tall Eddie make his customary stage appearance. He joked around with Janick Gers before Bruce appeared to ‘remove’ his heart, and spray us all with fake blood! As well as that the guys reached back to 1984 for another epic, ‘Powerslave’ from the album of the same name which saw the singer don a mask for the track. You know it’s getting near the end when ‘Fear Of The Dark’ is played, with the crowd chanting it’s opening refrain and of course, the main set ended with ‘Iron Maiden’ as the huge Eddie head appeared over the stage. The encore was (of course) ‘Number Of The Beast’, with ‘Blood Brothers’ and finally, ‘Wasted Years’ – which is another air guitar favourite of mine! This was a night that will live long in the memory; Bruce was in jovial form all night and you could see him laughing away as he joked with bandmates throughout. He can be spiky at times, if he feels the crowd isn’t with him but there were no worries on that score tonight, as he gave shoutouts to the various flags he saw in the crowd – pausing to ask what someone from San Antonio was doing in Liverpool! He then risked a few jeers (and cheers from this punter!) at the mention of Liverpool FC boss Jürgen Klopp; the singer revealed that Klopp (a fan of the band) was meant to be there tonight but because of ‘other commitments’ (i.e. his team’s game the next day) he was unable to attend. Bruce then reiterated that all who come to a Maiden gig are welcome no matter who you are or where you’re from, to universal cheers. This band have maintained their status throughout many musical trends, never fitting in with what’s popular and never caring one iota, while their fans just kept on coming. In that respect they’re similar to AC/DC or even Rush, bands who also exist in their own bubble with a fanbase which turns out regardless of trends. Watching these guys do their thing for two hours left me amazed, it was as though they were still in their thirties, their fitness levels must be off the scale to keep that up night after night. In addition, Dickinson’s vocal performance was top-notch, for a guy who recently battled cancer he was astounding. Almost three decades since they were last here, it was well worth the wait. Whether we’ll see the guys do this again in arenas is unknown, but they wouldn’t be the first band to want to keep it going as long as possible. It was a privilege to see their return to this city at long last, and if they do decide to go around once more, they’re welcome back – hopefully not in another 27 years’ time! Mere hours after a live performance with Soundgarden in Detroit, frontman Chris Cornell was found dead in the bathroom of his hotel suite. At the time of writing the medical examiner’s office has ruled it a suicide, doubly shocking for his and the band’s fans. In apparent good spirits before the show, the singer tweeted his excitement at performing in Detroit, ‘Rock City’ as he called it. He came to prominence with Soundgarden in the late 1980s; after two EPs for the Seattle label SubPop the band released its debut ‘Ultramega OK’ on the independent SST label in 1988, before they signed to A&M the next year, releasing ‘Louder Than Love’ which gained them international attention. The group made its first breakthrough in 1991 with the ‘Badmotorfinger’ album, coming as it did when the ‘grunge revolution’ erupted and spawning hits such as ‘Outshined’ and ‘Jesus Christ Pose’. At around the same time, Cornell was involved in the Temple of The Dog album alongside musicians formerly of the band Mother Love Bone; this album was intended as a tribute to that band’s vocalist Andrew Wood who died in 1990 shortly before the release of their debut album ‘Apple’. Several of the musicians involved went on to form Pearl Jam, to great success. The next album, ‘Superunknown’ (1994) put the band into rock’s premier league; the hits ‘Spoonman’ and then ‘Black Hole Sun’ (with its disturbingly surreal video) got them huge exposure on MTV. With the demise of Nirvana following frontman Kurt Cobain’s death that year, Soundgarden and Pearl Jam were left to carry the flag for what was being billed as ‘alternative rock’ at the time. By 1996, the huge success had taken its toll and after touring their ‘Down On The Upside’ album (this included a slot on the Lollapalooza tour that year after headliners Metallica requested the addition of Soundgarden to the bill) they split in early 1997. Drummer Matt Cameron later joined Pearl Jam and remained a member even after the 2010 reunion of Soundgarden. Cornell released his solo album ‘Euphoria Morning’ in 1999 (retitled ‘Euphoria Mourning‘ in a subsequent reissue), undertaking a tour to support it which came to the UK in 2000. The musical direction of this album was considerably more laidback than his old band, but was well-received. Following this, he surprised fans when he announced he would join forces with members of Rage Against The Machine to form the band Audioslave; the new band (considered a ‘supergroup’) was an immediate success, releasing three albums between 2001 and 2007. When that band ended, he returned to a solo career, releasing three more solo albums (‘Carry On’, 2007; ‘Scream’ 2009′; and ‘Higher Truth’, 2015). For ‘Scream’ he collaborated with hip-hop producer Timbaland, with the resulting record venturing into electronic pop territory. Soundgarden had reformed in early 2010 after several years apart; releasing a compilation (‘Telephantasm’) and touring the US, they then delved into their archives for a live album (‘Live on I-5’), released in 2011 but taken from tapes of several shows from their 1996 tour. Their reunion studio album ‘King Animal’, released in 2012, would prove to be the final Soundgarden album with Cornell. There was another compilation (‘Echo of Miles: Scattered Tracks Across the Path’) in 2014 which collated rare tracks with previously unreleased and live material, but plans for another studio album ended with Cornell’s passing. He was involved in many other collaborations and had his biggest UK success in 2006, scoring a top ten hit with the song ‘You Know My Name’, the theme tune to that year’s James Bond film (‘Casino Royale’, starring Daniel Craig in the title role). Feted for his powerful four-octave range voice, he won admirers from fans of classic rock as well as those who were in on the grunge wave as it happened. This rather quickly-written post hardly touches on his career or the impact he made on the rock scene in general, but in closing a few tweets from fellow rock musicians will help illustrate what a legacy he leaves. There are no words to describe my feelings about Chris Cornells sudden passing. His influence on me and the way so many others approached the microphone will always show itself in the music we create. He is survived by his wife and three kids including a beautiful daughter whom I heard also has an amazing voice of her own. Chris, we aren’t sure what demons or circumstances brought you to your passing at only 52… but we thank you for the loudness, the guts, blood and the sweat you gave us in this life … we will all carry your legacy forever. #chriscornell …say hello to heaven. UK hard rock band Inglorious have just released their second album, ‘II’ (does that mean ‘III’ will take a folkier direction and the fourth album will be untitled, lads? 😉 ) which was recorded here in Liverpool last year, at the famous Parr Street Studios. To promote the album at launch the guys appeared at Liverpool’s HMV store to play a short acoustic set and do a signing. The HMV store in Liverpool One has a small corner set aside for such events on the lower level, and a crowd of between 30-40 people had gathered. These things tend to be awkwardly timed, as they usually take place at around 5pm and unless you are working in the area or have time off, they’re not easy to get to. However on this occasion, I had the opportunity to attend and as it took place at Liverpool’s HMV store rather than one further up the M62, it’d have been rude not to have gone along! I have never actually seen Inglorious live until now; the gig I had planned to see last year in Wigan was nixed by another Same Night Syndrome – it clashed with a gig from former Wishbone Ash bassist Martin Turner who was playing in nearby St Helens. So this would be the first occasion I’d encountered them live in any capacity; they have since had one change to the ranks as guitarist Wil Taylor parted company with the group at the end of 2016. His replacement is Drew Lowe, who had been part of the band in its early days. However it is Taylor’s guitar which is heard on this album, alongside that of fellow axeman Andreas Eriksson. The guys came through the store to make their way to the performance area, with cheery greetings from singer Nathan James. Although the set was to promote the new album, they actually opened with two tracks from their debut (‘Until I Die’ and ‘Breakaway’). In between, the frontman regaled the audience with tales of their time in Liverpool, namedropping a few pubs including The Shipping Forecast. He also pledged that they’d love to come back for their third album, so it is likely they will once again pitch up at Parr Street when that time comes. Some of the new songs were played including ‘I Don’t Need Your Loving’, with a shoutout for radio statio Planet Rock who have consistently supported this band with airplay. Towards the end they let slip that there would be a UK tour in October this year; needless to say an audience member seized on that and asked whether it would include Liverpool. “I don’t know!” came the honest response from Nathan – “We don’t get to choose!” he added. He did however say that they would do their best, especially if enough of us bought the album (!) “We need to pay back our record label!”, he concluded. The acoustic set lasted around 30 minutes, enough time to demonstrate what a powerful and rangy voice he has, as well as showcasing Andreas Eriksson’s ability to shred even on acoustic guitar . Following the performance they gathered at a table across the store for the signing, everyone had either the CD or the LP version of the new album (the CD was £10, but the LP retailed at a whopping £27 – no prizes for guessing which one your correspondent plumped for!). These things tend to be a conveyor belt, but it was still possible to grab a quick chat with the guys. After the signing the staff gathered together those still remaining to have a photo with the band. I’ll listen to the album more thoroughly in the coming days and do a write up when time permits; their first offering was good but to me was a little familiar, and I would expect this to be similar in style but hopefully with more of their own stamp to it. It’s been an incredibly active month for Holly Henderson, a talented musician and songwriter (and guitarist in female rock combo DORJA) who I have been following for some time now. At the beginning of May she played her first gig with her new live band at a music event in her home town of Maidstone, which your correspondent saw, having made the crazy decision to drive all the way there from Merseyside, watch her set, hang for a while and drive back – all on the same night! More on that later, but hot on the heels of that, one of the tracks from her upcoming album (‘Loneliness’, which she performed at that gig) has now been aired on BBC Radio Kent, and if that isn’t enough, she has just unveiled the promo video for her song ‘Breakdown’, a track taken from her ‘Opium Drip’ EP. As well as all of that, she has been performing with DORJA, and has also appeared in a promo video for their track ‘Reaching Out’ which was shot in April, while all five band members were in the UK. (Vocalist Aiym Almas is based in LA while drummer Anna Mylee lives in Belgium.) DORJA will return for more UK live dates in July and I intend to see at least one, hopefully more of their shows. Many of the audience were known to her, including her mum who was situated to the left of the room close to the front. She was backed by her ‘guitar compadre’ Jamie Chellar, backing vocalist Katy Chellar, bassist Martin Taylor and drummer Luke Phillips. All were impressive players themselves (especially the drummer, who got the chance to kick up a storm close to the end of the set) and a cover of Radiohead’s ‘High And Dry’ provided Jamie with a moment in the spotlight. This outfit is tasked with recreating live the music made in LA with guitarist Pete Thorn, drummer Blair Sinta and bassist Jon Button and although I’ve yet to hear the finished album, on the evidence of what I saw this group will more than do it justice. At that gig Holly declared that ‘Loneliness’ would be the album’s first single, and it was played on BBC Radio Kent’s ‘Introducing’ programme on May 13 2017. This is a very ‘immediate’ sounding song, combining hard-driving guitar with Holly’s more tender vocal. She has said that while previously she has preferred to cover her vocals in reverb and other effects, she was encouraged by Pete Thorn to give her voice more prominence during the sessions for the album. Described as ‘awesome’ by BBC Kent presenter Abbie McCarthy, it bodes well for the album as a whole. Finally, her video for ‘Breakdown’ was released on May 16 2017. This video was directed by George Mays, who personally invited Holly to LA in order to produce the clip after having heard her ‘Opium Drip’ EP. She flew out in November 2016 and spent around a fortnight on the project. The finished video features some special effects, literally of Holly putting herself back together after a ‘breakdown’ – there are scattered limbs everywhere, but it isn’t quite as horrifying as it sounds! The low lighting in the clip suits the mood of the song perfectly, and she is a natural in front of the camera. The BBC Introducing Kent radio programme featuring Holly is linked here (available until mid-June 2017) and her song is featured at 45:27. Breakdown from George Mays on Vimeo. There seems to be an increasing number of live acts celebrating a particular ‘theme’ of music; for instance the touring Supersonic 70s (aka ‘Solid Gold 70s’) is a live band with male and female vocal, who celebrate all things 1970s with a selection of hits from the decade taking in many different musical styles, and all presented with a dash of humour and period clothes for the performers. It is a welcome change from the number of tribute acts out there; almost any reasonably well-known band now will know they’ve arrived when they have their own copycat tribute act. While it can be enjoyable, the idea of doing a show based on a theme rather than a particular band is starting to become popular and so it is with this show. It is exactly as it says on the tin, as far as I’m aware this is the only act of its kind on the circuit in this country. Once again a live band, but with two (sometimes three) female singers out front performing songs made famous by prominent female rockers. The band musicians themselves aren’t necessarily female, but on the occasion I caught them their guitarist certainly was. I was here mainly because DORJA guitarist Rosie Botterill was playing; she had been invited to guest on guitar for this show alongside their regular band. Looking at the website for this act, they seem to have a revolving cast of singers who come in as and when available. They have been known to include The Duchess from the band Space Elevator in previous shows, but for this show the singers were Emily J Clark (who has appeared with ‘Vampires Rock’ among other shows) and Aussie vocalist Sara-Louise. Eleven is a bar and function room set in an industrial estate, which is easy to miss from the road (I drove past it myself before realising) with a not-very-obvious entrance up a flight of steps. However once inside, the room is spacious with a decent-sized stage. The group came on stage just before their scheduled start time of 9pm, with the singers and guitarist Rosie accompanied by male musicians: bassist Steve Clay, drummer Mick Neaves and keyboardist Jamie Brooks. They kicked off with a rendition of Pat Benatar’s ‘Heartbreaker’ which introduced the powerful voice of Sara-Louise and ran through a series of rock favourites, including Joan Jett’s ‘I Hate Myself For Loving You’, Blondie’s ‘Atomic’ and Stevie Nicks’ ‘Edge Of Seventeen’. The songs were sometimes performed as duets, with the ladies taking the verses in turn, or sometimes one would step to the front of the stage while the other provided a backing vocal. Not everything was obvious 1980s classic rock however; some surprises included Skunk Anansie’s ‘I Can Dream’ (which Sara-Louise described as more modern. It is, kind of – but it’s now 20 years old!) and ‘Remember My Name’ – a minor hit for Stevie Lange which is best remembered as a theme to a perfume ad from the early 1980s. Whatever they sang, the vocals were impressive from both women. These songs aren’t exactly crooned, after all! Sara-Louise took on the daunting ‘Alone’; described as a Heart song (it was a huge hit for them, but was originally written and recorded by the obscure act i-Ten) while the power ballad quota was maintained with Cher’s ‘I Found Someone’. After an impressive cover of ‘I Got The Music In Me’ (a 1970s hit for Kiki Dee) there was a short interval. The act did tread some more familiar ground, covering Tina Turner’s ‘What’s Love Got To Do With It’ and ‘Because The Night’, a song which was a hit for Patti Smith in the late 1970s but co-written with Bruce Springsteen (who has performed a version himself with different lyrics). They closed out with Suzi Quatro’s ‘Can The Can’, before ending as they started with a Benatar cover (this time ‘Love Is A Battlefield’). The encore was a Bonnie Tyler medley/mashup , starting off with ‘Total Eclipse Of The Heart’ they segued into ‘Holding Out For A Hero’, which saw both Emily and Sara-Louise come to the fore. And that was our lot! Special mention must be made of Rosie, who had only a short time to learn a lengthy set and did a terrific job of filling in for their regular guitarist (Alex Ward). I got to speak to her afterwards (and get an obligatory photo!) and she said that she would be performing again with this act, although she didn’t know yet exactly when. She was concentrating hard on her playing, usually she is a little more expressive with her trademark ‘bounce’ as seen with DORJA and in her previous life in a punk cover band, but here she was more restrained, taking the lead when prompted but largely giving the singers the spotlight. She is a self-confessed fan of Slash and this show was therefore special for her to perform in his home town. This act plays frequently across the UK and so I will aim to see them again when they come to the North West. Available only by mail order, this new bi-monthly publication comes out at a time when there seems to be a glut of magazines covering this style of music. Radio station Planet Rock is to launch its own magazine in May 2017, and the long-established Classic Rock magazine has been resurrected after apparently having met its demise at the end of last year, when its publisher went bust. So why do we need this publication? Only time will tell whether or not we do, but the initial signs are positive. Rock Candy is a label specialising in reissues of classic hard rock albums, some that have been long out of print. The label boss (Derek Oliver, one-time AOR correspondent for Kerrang! magazine) explains in his introductory piece that when he launched the label in the mid-2000s, he was scoffed at for insisting on putting the reissues out on physical CDs. Similarly, with this magazine, he and his team (consisting of many familiar names to Kerrang! readers of the 1980s) wanted to publish a magazine ‘actually printed on actual paper’ – feeling that the in-depth content of the magazine can only be appreciated properly with a physical paper magazine. It is indeed printed on very glossy paper, with full colour throughout, and the articles run to several pages in length. In particular, Oliver drew attention to one eight-page article on veteran Swiss hard rockers Krokus in this issue, saying that no publisher – or any sane person – would have let them do that had they not done it themselves! They have made it possible to view an electronic copy of the mag for those who send for it, as was the case when I took out my subscription a link was emailed to me to access it immediately. However, I wanted to receive my physical copy before commenting. 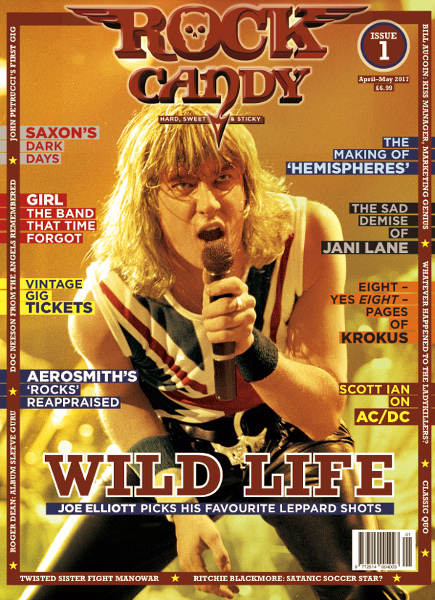 The cover features a vintage, ‘Pyromania’-era shot of Def Leppard frontman Joe Elliott, and what you’ll get inside the magazine is an unapologetic celebration of the era spanning the 1970s and 1980s, ‘when rock was better’ as they put it. To that end, the debut issue features lengthy pieces on Rush (the making of ‘Hemispheres’, Saxon, Girl, an appraisal of AC/DC from Anthrax guitarist Scott Ian, with articles on KISS manager Bill Aucoin and one documenting the sad demise of Warrant frontman Jani Lane. Def Leppard are covered with a series of vintage photographs (I see what you did there, fellas!) accompanied by explanatory notes for each by Joe Elliott himself. As well as all that there is a review section covering the latest reissues both on Rock Candy records and also from other labels. The whole point of this magazine is nostalgia, so there is also a picture section showing ticket stubs from 1980s gigs, a look back at two encounters with Ritchie Blackmore (including an amusing tale of his football playing exploits), and a feature examining news stories from the world of rock 30 years ago but with the benefit of hindsight. They haven’t totally eschewed the modern day; publisher Derek Oliver, editor Howard Johnson and two familiar names from Kerrang’s halcyon days (Malcolm Dome and Paul Suter) have compiled a list of video clips to look up on YouTube. Each writer chose a theme, for example Oliver picked a selection of Southern Rock clips to watch out for while ‘HoJo’ chose some classic Thin Lizzy for your viewing pleasure. If all that wasn’t enough for you, there is even a feature that recalls Kerrang’s ‘Lady Killers’ segment. That was an occasional spot showcasing a female rocker (usually a singer) accompanied by a glamorous photo; this article revisits some of those Lady Killers and brings us up to date with what the likes of Lorraine Lewis and Lee Aaron are doing now. If you were a reader of Kerrang! in the days before Kurt came along, you will enjoy this magazine. Well-written articles as you’d expect from writers of this calibre, plenty of pictorial content, and in-depth features giving the artists themselves room to express themselves. My only niggle is the insistence on focusing solely on past glories; the team have intentionally stated that their remit is the 1970s and 80s era (with an occasional dip into the 1990s according to the publisher) and by sealing themselves off like that, there is the danger of this publication falling into the trap Classic Rock sought to avoid. That publication covers newer artists who (broadly) fall into the style set down by the greats of the past, as well as the greats themselves, and they did this in order not to ‘become a museum’ as they said. How much mileage Rock Candy can get out of artists from a set timeframe, and an era of 30-40 years ago remains to be seen but it has to be finite. Indeed the way they’ve approached it makes me think of the Northern Soul scene; another era of music that is sealed within a set timeframe and one that is jealously guarded by its ‘purists’. The classic rock scene has its purists too, but I do feel that there has to be room for new bands otherwise sooner or later you end up repeating yourself. Presumably the publishers of Rock Candy are hoping that they can help their readers discover (or rediscover) bands and albums that might have been missed first time around; the readers of this mag are likely to be the same people who read Kerrang! and Metal Hammer in the 1980s but back then, our pockets won’t have stretched to buy every single album recommended by the writers. Despite this quibble I have taken the plunge and subscribed for the year, which will see five more issues arrive in my letterbox. I hope they can prove me wrong and that this mag does have longevity, it being independently published means that they made it available solely by mail order because of the cost implication of having it distributed to newsstands. You would have to be a dedicated rock fan then, in order to actually subscribe and the publishers are hoping enough of us are still out there to make this venture succeed. I hope they’re right!